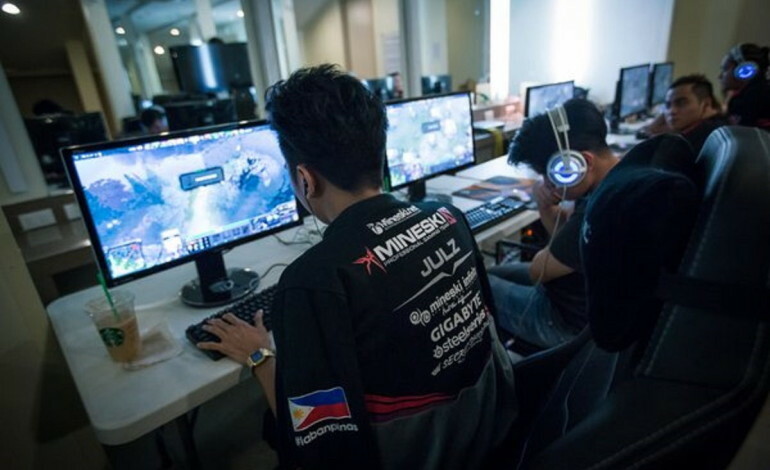 Mineski Dota may be filing charges and pursue legal action against former players for breach of contract. The organization has revealed that this is a step towards the pursuit of higher professionalism and accountability. At this time, no charges have been filed yet, nor specific players identified. Earlier today, Mineski Dota have announced via Facebook that the organization is considering filing legal cases against former players that have breached their contract responsibilities and obligations. The actions will specifically focus on players that have left the team while still under active contract. The management have decided to break our silence. 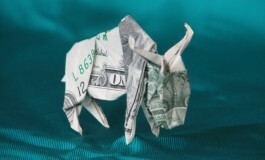 We’ve thought that this is the best time to put a stop on these acts. The door is already open for the Filipino talents to step into the world stage. If we want to pursue the goal to have a world championship under our country’s flag, may it be us or other teams, we need to straighten up our acts and be true professionals. No players have been named. 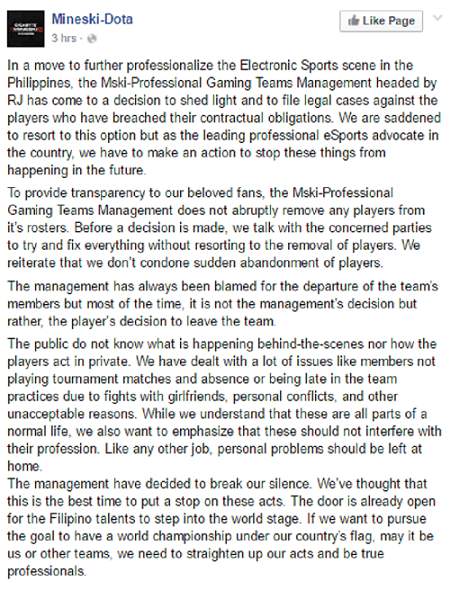 However, RJ, head of the Mineski Pro Gaming Management, stated in an interview this morning: “We just ask that they serve out the rest of their contract and honor their remaining responsibilities. We have no hard feelings with our other ex-players.” He continued to clarify that no actual lawsuits have been filed as of yet and the organization is still considering all of their options. The message on Facebook sheds light on some of the issues that occur regarding teams, players and organizations behind the scenes. The intent, according to Mineski, is to bring about more transparency in efforts to help the professional esports scene in the Philippines. The Philippines has been working long and hard to establish themselves within the gaming scene. According to Mineski CEO – Ronald Robins, “the industry of Esports here in the Philippines has been lagging behind in comparison to other regions” and the regional scene has improved during the course of the last years. Only last weekend, ESL One Manila took place in the Philippines and was regarded as a huge success by fans, viewers and teams alike. The event was quite a big deal in the region, generating much attention and recognition to the growing esports industry. ESL One Manila was the first $250,000 Dota tournament, as well as the very first premier international LAN to be hosted in the Philippines. To commemorate the event, the ESL One Manila Finals were broadcast live on TV5, a local non cable channel. The rest of the entire tournament was aired on AksyonTV, a TV5 subsidiary. Mineski CEO – Ronald Robins, spoke during a press conference last week about the significant growth of the Philippines and the journey to becoming a major contender in the international esports arena. Ulrich Schulz, Electronic Sports League’s Vice President for Gaming echoed that sentiment at a press conference and said that ESL One Manila has been a record-setter in event sales, with “the turnout being one of the fastest sold-out events in ESL history”. Even the local Department of Tourism recognized the economical and tourist implications of the event. Teams, crews, staff and fans had traveled into the city from all over the world and the department officially endorsed ESL One Manila, listing the competition on the country’s Tourism Promotions Board (TPB) as one of April’s bigger tourist attractions. The country is now looking forward to hosting the Manila Major, one of the four premier Dota 2 events of the year, sponsored by Valve. On the heels of the ESL One Manila success, the scene continues to ride on the momentum with lightening speed during this critical time to establish themselves as a front runner in the industry. The Manila Major will be held between June 7-12, at the Mall of Asia Arena, in Manila, Philippines, with a set prize-pool of $3,000,000. Sixteen teams will compete in the main event hosted by PGL and Valve. In the winter season leading up to the Shanghai Major, Mineski Dota was consistently besting the SEA giants, Fnatic, for the qualifier spots in LANs. They were quickly rising to the top in the region and making an international name for themselves. Unable to lock up any major achievements, the Filipino team experienced some roster changes, welcoming Benhur “Ben” Lawis and Jun “Bok” Kanehara to the mix. In an effort to grow the local scene and showcase regional talent, a local Filipino Dota 2 team was given their own set of qualifiers to determine one team to compete alongside some of the best Dota 2 teams in the world. Mineski was able to best their regional rivals, TnC Gaming, 3:1, in the best-of-five grand finals, seizing the place in the main event for the Philippines. They eventually placed 7th-8th in the event. On April 26th, the team’s coach Mark “Cast” Pilar replaced Jessie Cristy “JessieVash” Cuyco in the position five support.